Last post I talked about the perhaps not so interesting topic of data generation and caching, not a subject many people can get very excited about, but this time I want to talk about something I think is far more interesting. 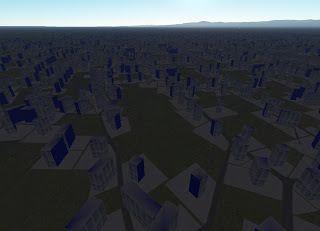 City Generation. 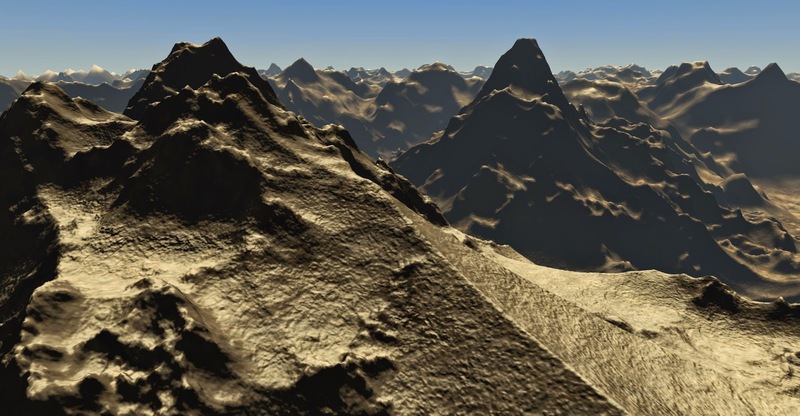 I’ve been interested in procedural landscape/planet generation for at least ten years, and over that time have seen at least dozens if not hundreds of landscape projects produced by other people out there who share this interest. One thing many of these projects have in common however is their landscapes however pretty tend to be fairly devoid of human infrastructure. 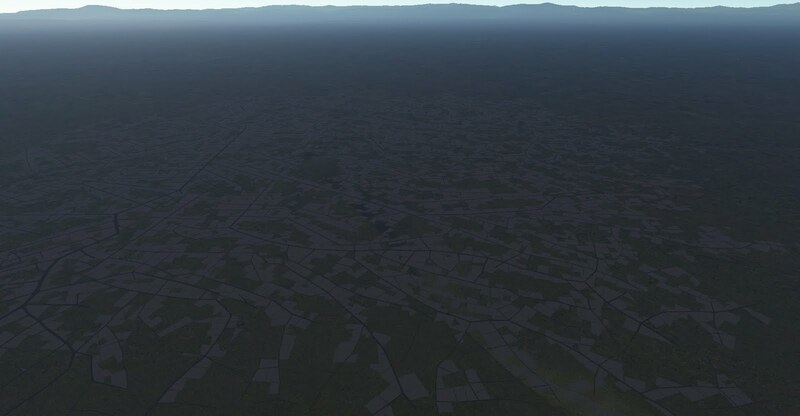 One reason is it’s generally easier due to their inherent fractal nature to generate decent looking mountains, valleys and even trees and grass than it is to produce realistic roads, railways, towns and cities. 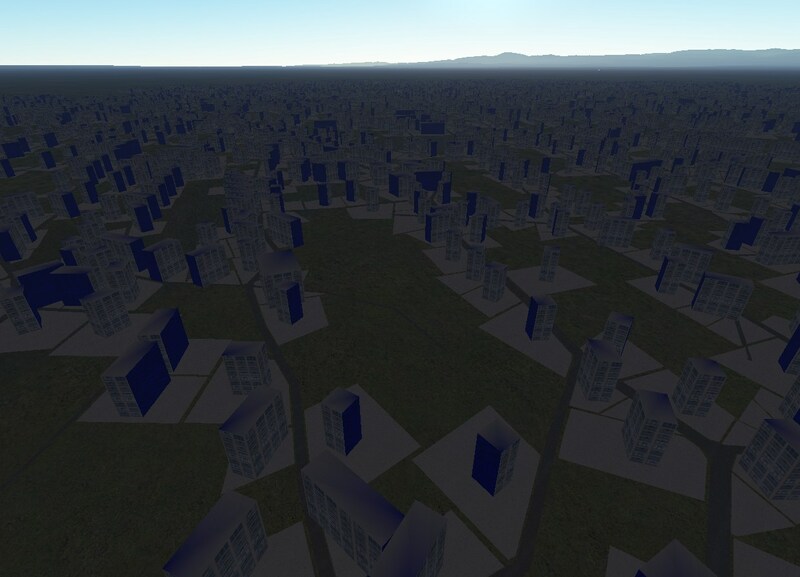 Heightfield generation for landscapes is also a well covered topic with many professional and amateur research papers and articles on the subject – not so much on infrastructure simulation. I’m as guilty of this as anyone else – none of the several landscape projects I’ve created in the past could boast anything particularly man made, no roads, no bridges, no buildings or at least none that were arranged in a manner more sophisticated than randomly dotted around on flat bits of ground. 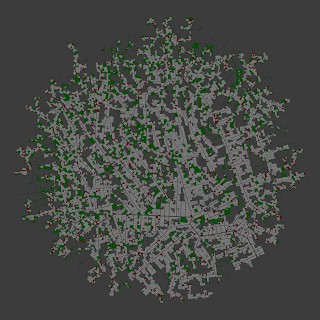 So I thought it about time I got stuck in to what I consider to be a very interesting problem – that of procedural city generation. A tricky problem to be sure but that is of course what makes it interesting. However that’s all still on the drawing board so for now I’m just picking points at random that aren’t too close to each other and not too close to water. Simples. 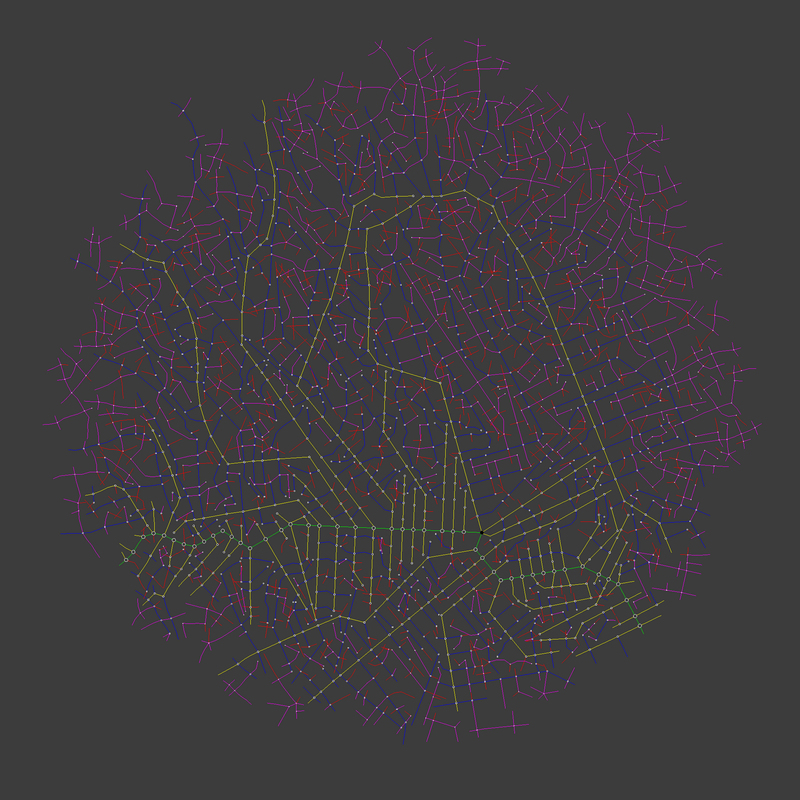 The approach I'm taking is to first generate a road network for the city, then to find all the bounded areas enclosed by the roads (I am calling these "charts") before subdividing these charts into convex "lots" each of which will ultimately receive a building type chosen based upon city parameters and lot placement. The road network is made up of two types of entity, "road segments" and "junctions". The starting point for generation is a set of one or more junctions placed randomly within the central area of the city, each of which has between two and five connection points onto which road segments can be added. A loop then continually looks at any junctions in the road network that have connection points without roads attached and tries to add a road segments onto each of them. In addition to adding road segments onto junctions it also looks at any road segments that are only connected at one end - either to a junction or to a preceding road segment - and tries to add another road segment or junction on to that segment. Make sense? Effectively each iteration of the loop causes the road network to grow by one step, each step either adding a road segment onto a previous one, adding a junction onto a previous road segment or adding a road segment onto a previous junction. Each road segment is given a "generation" number, the ones created from the initially placed junctions are generation zero and then every time a junction is added on to the end of a road segment which then spawns further road segments that aren't continuations of the original road these child segments are given a higher generation number, 1, 2, 3, etc. This generation number can then be used later when deciding on the type of road geometry to create - generation #0 could be dual carriageway for example, generation #1 main roads and generation #2 narrower secondary streets. Proximity constraints are applied at each step to prevent roads being created that would be too close to existing roads or junctions, and connection tests are made to see if an open road end is close enough to a junction with an open connection point to allow the two to be connected. The amount of variation in road heading also changes with generation and distance from the centre of the city - so low generation roads tend to be straighter while high generation (i.e. 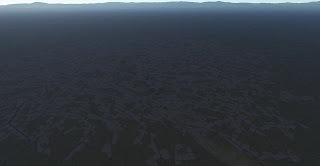 minor roads) tend to wriggle around more creating the suburbs. The amount of variation also increases as roads are further from the city centre. 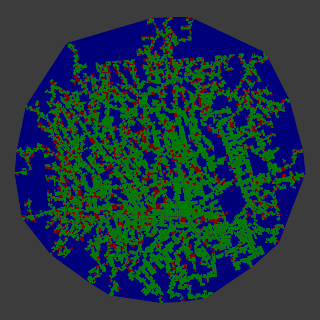 In these images the Green roads are generation zero, Yellow is one, Blue is two, Magenta is three and Red is four. 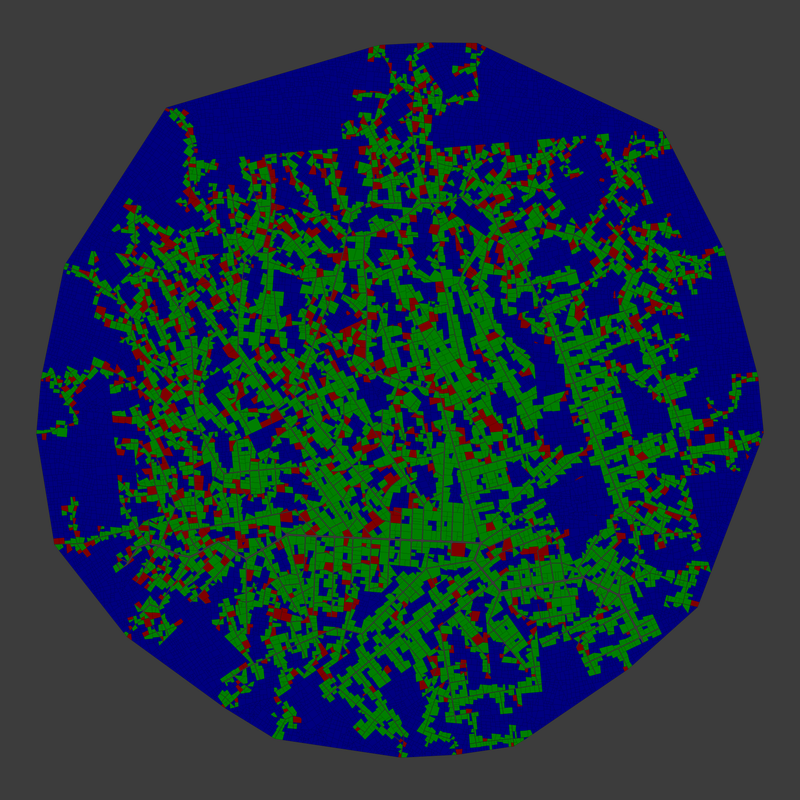 You will see that at certain points it appears to skip a generation (a red road directly from a blue one for example) - this is a result of a road segment from the intermediate generation being created then removed due to a proximity constraint violation but then the cause of the violation in turn being later removed due to a violation of it's own allowing a new road of a later generation to replace the original. Once no more roads or junctions can be created due to proximity constraints or distance from city centre checks the process terminates. 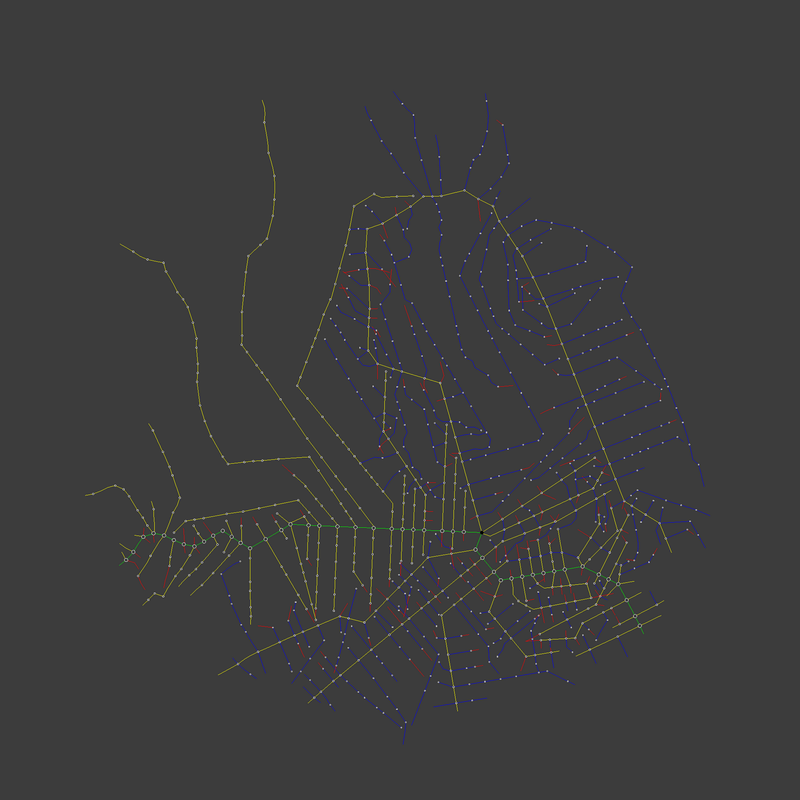 Once the entire road network has been created the next step is to find all the enclosed areas (which I call "charts") which will eventually provide the lots for buildings to be placed on. 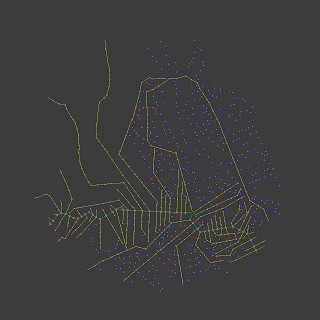 To do this I first use Andrew's Monotone Chain Algorithm to find the convex hull that encloses the entire road network, tracing around from any exterior road vertex with this then produces one big chart enclosing the outskirts of the city. 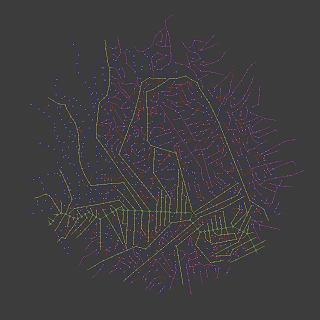 Tracing around from all other uncharted vertices in turn then adds a number of additional charts each representing an enclosed area of the city. 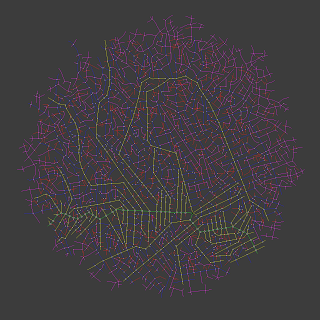 As you can see each chart represents a connected area of the city entirely enclosed by roads or the city boundary. 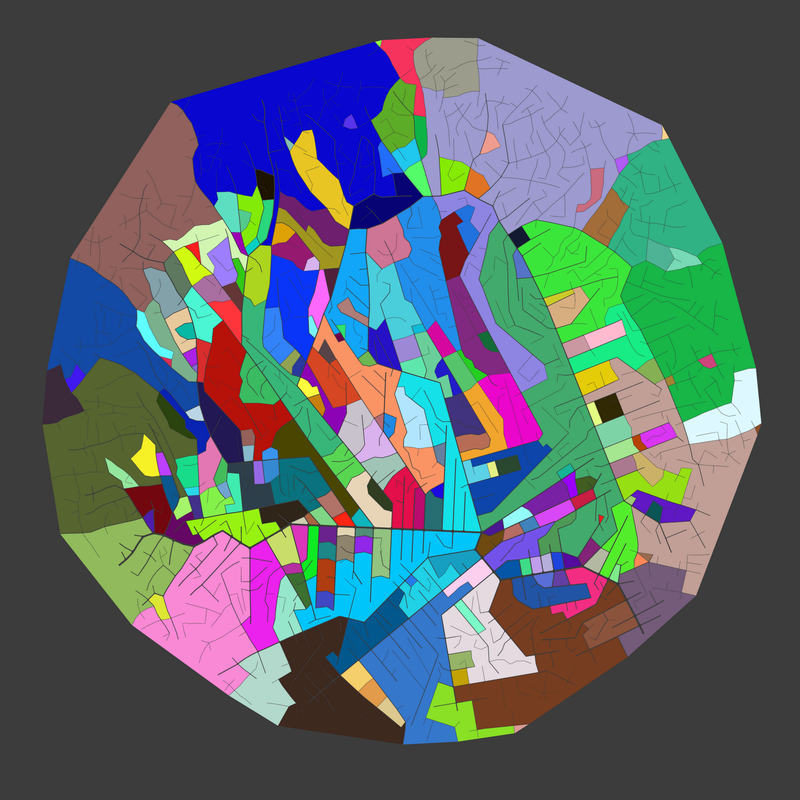 They are pretty much all concave though and hard to work with further due to this complexity, so the next step is to break these charts down into convex "lots" onto which individual buildings can be placed. There are several ways this can be done, and I tried a few of them to see which worked best. First I tried combining "ears" of the charts into convex regions. Ear clipping is a common algorithm for triangulating complex polygons and involves finding sets of three adjacent vertices where the vector between the first and third vertex doesn't cross any other edge of the polygon, effectively forming a corner or "ear" - you keep doing this until you have no polygon left which as long as there aren't any holes is guaranteed to occur. The downside of this approach is that you end up with all sorts of random shapes many of which are narrow slivers or shards not very well suited to building lot usage. Next I tried finding pairs of vertices in the polygon that were as diametrically opposite as possible while having a vector between them that didn't intersect any other polygon edge. The thought was that this would continually chop the polygon roughly in half producing more even lot distribution but in practice the shapes produced were no more regular and still not suitable. Finally the solution I settled on was to find the convex hull of each chart (again using Andrew's Monotone Chain) and from this find the vector representing the hull's longest axis. This was done by summing the length of each edge into buckets each representing an angle range (10 degrees in my case) then taking the angle from the bucket with the longest total edge length accumulated. The chart was then rotated by this angle to align this longest axis with the Y axis before finally clipping the chart into two pieces across the middle in the X axis to form two new charts. Repeatedly doing this until the individual charts are small enough to count as lots produces a set of output charts many but not all of which are convex - I decided to classify the convex ones as building lots and the remaining concave ones as greenfield lots for parks, car parks or other non-building purposes. Here the grey charts are suitable for building with the green ones representing parks - the red charts have been classified as being too small to be considered further - in practice these would probably end up being simple tarmac areas suitable for street furniture. Although it's far from perfect I'm not too unhappy with the result - it could be better, I would like to see more consistently useful lot shapes for example but it may be good enough to be getting on with. 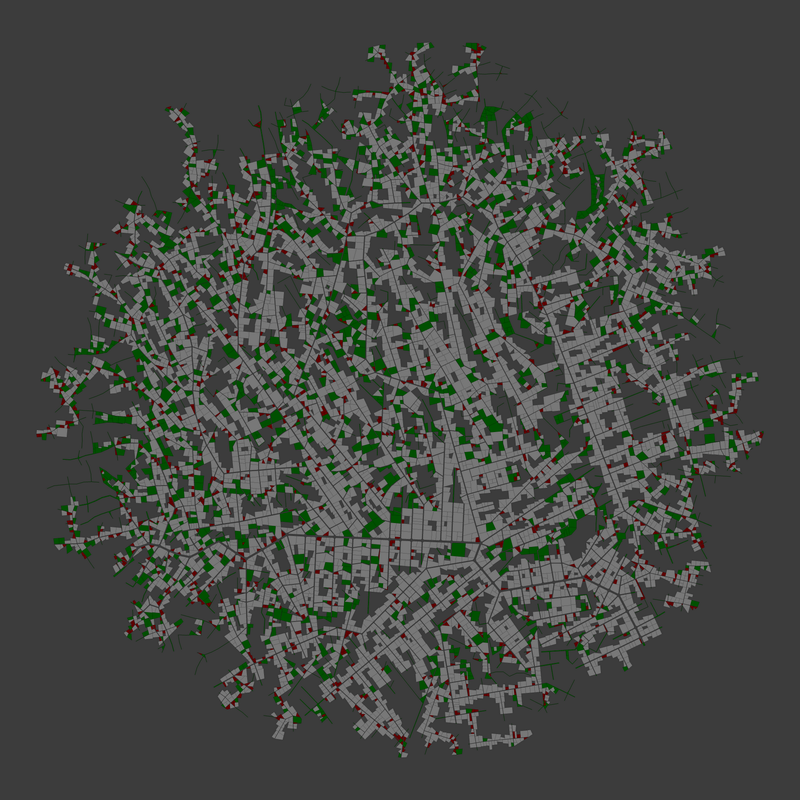 Found a very impressive blog: "Procedural World"